Still from "My Love Affair with the Brain: The Life and Science of Dr. Marian Diamond." For nearly 55 years, until her retirement in 2014, Marian Diamond would often be seen walking through campus to her anatomy class carrying a flowered hat box, within which nestled a real, pickled human brain. Gently lifting it from its wrapping, she would display it to classes and express her awe that such a small, three-pound mass of protoplasm was the most complex structure known to humankind. Trailer for "My Love Affair with the Brain: The Life and Science of Dr. Marian Diamond," a new documentary by Luna Productions. Over the course of her career, Diamond, a professor emeritus of integrative biology at UC Berkeley, demonstrated that an enriched environment builds better brains and helped establish the now accepted idea that the brain changes throughout our lifetimes and that we need to continually “use it or lose it.” She also conducted the first scientific analysis of Albert Einstein’s brain. 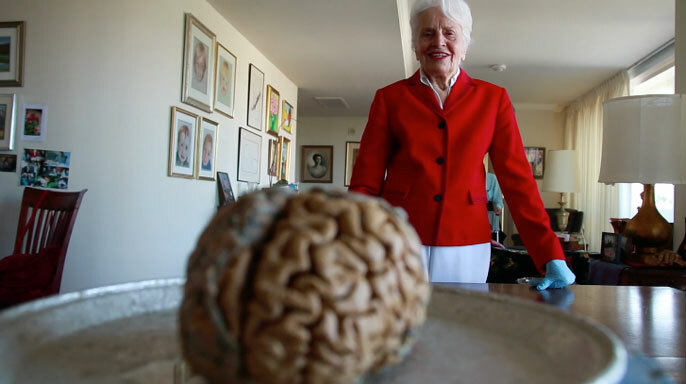 Now 89, Diamond is the subject of a new one-hour documentary, My Love Affair with the Brain: the Life and Science of Dr. Marian Diamond, that will get its local premiere Saturday, Feb. 27, at 1 p.m. in the new Berkeley Art Museum and Pacific Film Archive. Catherine Ryan and Gary Weimberg, co-directors and producers of the documentary, will host the free preview, along with BAMPFA, the California Alumni Association and UC Berkeley’s Helen Wills Neuroscience Institute, Lawrence Hall of Science, Department of Psychology, Division of Biological Sciences, Department of Integrative Biology, Department of Molecular and Cell Biology and Center for Research and Education on Aging. Following the screening, three brain researchers will join Ryan and Weimberg to discuss the film: UC Berkeley alumna Wendy Suzuki, a neuroscientist at New York University and author of the 2015 book Healthy Brain, Happy Life: A Personal Program to Activate Your Brain and Do Everything Better; Daniela Kaufer, a UC Berkeley associate professor of integrative biology who studies the effects of stress on the brain; and Robert Knight, M.D., a UC Berkeley professor of psychology who studies how the prefrontal cortex controls human behavior. Film covers the multifaceted career of a "brain whisperer"
An overflow room seating 400 has also been set aside for viewing the film and discussion in room 2050 of UC Berkeley’s Valley Life Sciences Building, a block east of BAMPFA. The documentary, filmed over five years, covers the personal, scientific and teaching career of a neuroscientist who changed the way we think about the brain and eventually became a YouTube celebrity and role model for women. Diamond’s teaching style, preserved on YouTube videos that are among the most popular courses on the Internet worldwide, motivated Ryan and Weimberg, her husband and partner at Luna Productions, to approach Diamond in 2010 and propose a video film about her life and work.